from my kitchen window - how cute is this? I have been 'tagged' again, this time by Celia of Purple Podded Peas. Celia is an illustrator, printmaker and book designer, who works from her home studio attached to a beautiful walled garden where she loves to grow fruit and vegetables. This time it's random things about me and the garden, which is really going to get me thinking as although we have a gorgeous, large garden, I'm not much of a gardener - my husband does most of it, thank goodness. The best bit for me is to cook the fruit and vegetables he has grown and potter about in the greenhouse. It takes me 2 hours just to mow 'my' bits of the lawns. I love growing fresh herbs in the garden. There are 3 varieties of apples in our garden, but I don't know which varieties they are. You might have already guessed, from number 3, that I'm useless when it comes to the names of plants, and have to rely on my mum for help with identification. I would love to discover a way to keep the brambles out of the garden - for good. There's nothing better than to go out and pick your own produce and eat it the same day. I hate weeding - so come on over Celia and do mine for me!! I won't be tagging anyone this time because it seems that most blogs have already been tagged, but if anyone reading this hasn't and wants to join in - please do! I forgot to mention that Marie over at Marie's Muses gave me a Rockin' Girl Blogger award last month. 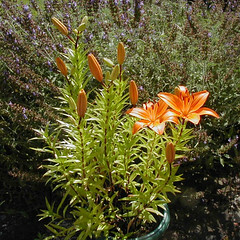 Marie - I am honoured that you even thought of giving me this, as I am still new to blogging and there are many other blogs more worthy of this than mine - thank you. I've joined the 'foodie blog roll', which was created by Jenn, The Left Over Queen and aims to bring fellow food bloggers together. You can join too if you have a food blog - just click on the link in the sidebar at the right of this page to go there. Thanks for sharing those random facts about you and your garden. 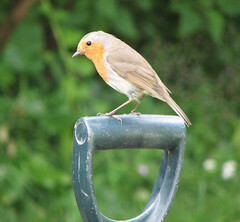 Birds obviously love your garden as much as you love the fresh herbs and prduce. In your part of the world there are sure to be some "Apple Days" at orchards in October - you can take fruit from your own trees to be identified. 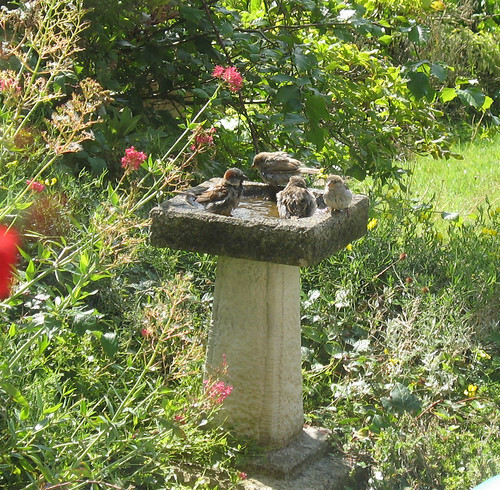 Loved your garden pictures of the birds Nic! I have never been able to get any good ones of mine! Loved your random facts too! Celia - thanks for the advice - I'll do that with the apples. Jenn - thanks for the welcome! Marie - the birds are cute - young ones I think.